King of Prussia (also referred to as KOP) is a census-designated place in Upper Merion Township, Montgomery County, Pennsylvania, United States. The community took its name in the 18th century from a local tavern named the King of Prussia Inn, which was named after King Frederick the Great of Prussia. Kevin Smith Transportation Group services the entire Delaware Valley. KSTG delivers services daily in Bucks, Chester, Delaware, Montgomery, and Philadelphia counties. This includes more than 300 cities, towns, boroughs, and townships. One of the places you will regularly see a KSTG vehicle is King of Prussia, PA.
Kevin Smith Transportation Group offers a variety of services in King of Prussia, PA. On the social side, a KSTG Limo or Wedding Shuttle might be seen on any given weekend. Requests for a Limo for a Night on the Town or a Party Bus to go to Philadelphia, PA for a concert or show are routine for residents of King of Prussia, PA. If someone in King of Prussia, PA is headed to the Manhattan Cruise Terminal or Philadelphia International Airport (PHL), you can be assured that a KSTG Black Yukon or Mini Bus are ready for pickup. If you run or work at one of the many successful companies with offices in King of Prussia, PA, you may occasionally have a need for some of the Corporate Transportation services offered by Kevin Smith Transportation Group. This could include Airport Transportation to more than 8 International Airports, including Newark International (EWR), Kennedy Airport (JFK) and of course Philadelphia International (PHL). Shuttle Services are also popular for companies in King of Prussia, PA, often moving employees from local SEPTA stations to company offices. In the afternoon, those same KSTG Sprinters or Mini Buses will take those employees back to the train as they head home to Philadelphia, PA. For companies that utilize Private Aviation to travel around the country, a KSTG Cadillac XTS or Black Yukon is likely to be seen across King of Prussia, PA, headed to one of more than a dozen regional airports, including Northeast Philadelphia Airport, Wings Field or Doylestown Airport. Kevin Smith Transportation Group wants to thank everyone from King of Prussia, PA for choosing us as their preferred Transportation Company. With a focus on Luxury and Service, KSTG wants to be your only choice when considering transportation for everything from a once in a lifetime Wedding celebration to needing Shuttles or Sprinters for a Corporate event. KSTG and King of Prussia, PA, working together for all your Transportation needs. Like the rest of Montgomery County, King of Prussia, PA continues to experience rapid development. The largest shopping mall in the United States, the King of Prussia Mall, is located here. Also located here is the headquarters of the Nuclear Regulatory Commission Region I. King of Prussia is considered to be an edge city of Philadelphia, consisting of large amounts of retail and office space situated at the convergence of four highways. With so much convergence of business and transportation, Kevin Smith Transportation Group finds the King of Prussia, PA area to be one of our busiest corporate markets, with Sprinters and Mini Buses making regular pickups across the community. The eponymous King of Prussia Inn was originally constructed as a cottage in 1719 by the Welsh Quakers William and Janet Rees, founders of Reesville. The cottage was converted to an inn in 1769 and did a steady business in colonial times as it was approximately a day’s travel by horse from Philadelphia, PA. Settlers headed west to Ohio would sleep at the inn on their first night on the road. In 1774 the Rees family hired James Berry to manage the inn, which henceforth became known as “Berry’s Tavern”. General George Washington first visited the tavern on Thanksgiving Day in 1777 while the Continental Army was encamped at Whitemarsh; a few weeks later Washington and the army camped at nearby Valley Forge. Parker’s spy map, created by a Tory sympathizer of the Kingdom of Great Britain, listed the inn as “Berry’s” in 1777, but a local petition in 1786 identified it as the “King of Prussia”. It was possibly renamed in honor of Benjamin Franklin‘s pro-American satirical essay “An Edict by the King of Prussia”. At some point a wooden signboard of the inn depicted King Frederick II (Frederick the Great) of Prussia. The inn is listed on the National Register of Historic Places. Ironically, the inn was forced to move with the expansion of U.S. Route 202. The extensive suburban development that has taken place since the 1960s in King of Prussia has led urban planning scholars like Joel Garreau to label the area as an epitome of the edge city phenomenon, a situation where the most vibrant economic growth and prosperity in a metropolitan area (in this case, Philadelphia) no longer occurs in the urban center, but rather at its periphery. The growth in King of Prussia developed around the convergence of four highways with the construction of the King of Prussia Mall, a large business park, and housing developments. In the late 1980s, developer Dennis Maloomian acquired a golf course near the King of Prussia Mall and planned a mixed-use residential and retail development that would include a town center for King of Prussia. The proposed development needed to be rezoned but Upper Merion Township officials and local residents were opposed to the plans. After several court battles, the Pennsylvania Supreme Court ruled in Maloomian’s favor in 2003. The planned development became known as the Village at Valley Forge and would include a suburban downtown, apartments, townhouses, and offices. The retail area would be known as the King of Prussia Town Center. The first part of the town center was completed in 2014 with the opening of a Wegmans grocery store. This was followed by the construction of the downtown area with several stores and restaurants. Offices are being constructed and residential areas are in development. By the 2000s, the business park in King of Prussia was outdated and was losing tenants. By 2009, several office building owners pushed for Upper Merion Township to improve the business park. Improvements were made to King of Prussia including landscaping the median of US 202, installing King of Prussia signs at the borders to the community, creating a shuttle service connecting the business park to nearby train stations, and changing the zoning laws to allow for apartments and townhouses to be constructed in the business park. The vacancy rates at the business park have since dropped. On August 18, 2016, the two sections of the King of Prussia Mall, The Plaza and The Court, were joined to create one large shopping mall. It is not uncommon to have clients of Kevin Smith Transportation Group book everything from a Black Yukon to a Stretch Limousine and make it a day of shopping at the King of Prussia, PA mall. King of Prussia is well served by SEPTA Suburban Division bus routes at the King of Prussia Transit Center at the King of Prussia Mall, which serves six bus routes providing service to West Chester, PA, the Exton Transportation Center at the Exton Square Mall, the Norristown Transportation Center, Phoenixville, PA, the 69th Street Transportation Center, Center City Philadelphia, Chesterbrook, Valley Forge, and Limerick. In addition, a SEPTA Suburban Division bus route runs from Gulph Mills to the Willow Grove Park Mall in Willow Grove. The Gulph Mills station is served by SEPTA‘s Norristown High Speed Line, which runs between the 69th Street Transportation Center and the Norristown Transportation Center. There is a proposed rail link with 10 stops to Norristown that is estimated to add $946 million in assessed property values for about a $1 billion investment. King of Prussia is home to the King of Prussia Mall, which is the largest mall in the United States in terms of leasable space. The mall consists of over 400 stores, 8 anchor stores, and over 40 restaurants. The mall has several luxury stores that have their only Philadelphia area location in King of Prussia. The King of Prussia Mall is surrounded by several big-box stores, restaurants, hotels, and other businesses, including a United Artists Theatres and an iFLY indoor skydiving center. The King of Prussia Town Center is a lifestyle center that consists of Wegmans, multiple other big-box retailers, and a downtown area with dining, retail, and service establishments and a Town Square. The town center is part of the Village at Valley Forge, a 122-acre mixed-use development under construction that consists of retail, apartments, townhouses, condominiums, office space, and the Children’s Hospital of Philadelphia‘s “Specialty Care and Surgery Center”. 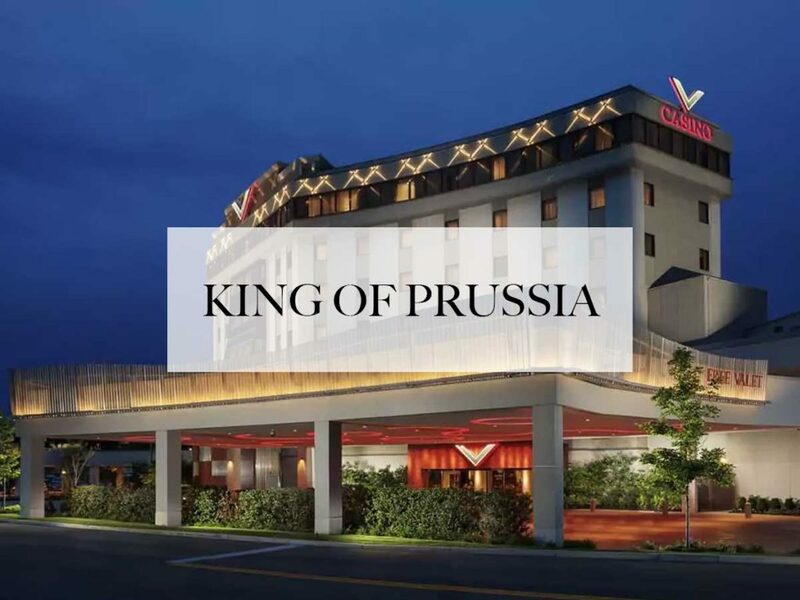 King of Prussia is also the location of the Valley Forge Casino Resort, which has over 500 hotel rooms, 600 slot machines, table games, seven restaurants, a spa, nightlife, a convention center, and a seasonal poolside club called Valley Beach. Valley Forge National Historical Park, which consists of the site where General George Washington and the Continental Army made their encampment at Valley Forge during the winter of 1777-78 in the American Revolutionary War, is located to the west of King of Prussia. PA.